I have not heard it that ADD (attention deficit disorder) would develop in people as they age, it seems to be more of an adolescent trait. However, even though my youth days are long behind me, I have been finding it difficult as of late to concentrate on music. It is one thing when an album grabs me early and completely, but I have not been willing to “work” with the music lately. Starting and putting an album aside is a bad thing these days, as there is a good chance I may not be coming back for many more spins. EPs, MCDs and shorter vinyl versions have been a saving grace, a way to get a quick fix, hear something new, not to mention going through these shorter releases provides a slim hope of clearing my deck from promos, or at least putting a tiny dent in the process. 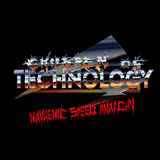 Italians Children of Technology make things short and rather to the point on their Mayhemic Speed Anarchy 7”EP. And how else should things be if you call thrash punk home? Mayhemic Speed Anarchy, in a way, is Children of Technology getting back to their earlier strategy of numerous splits and short releases after rather impressive 2010 full-length effort It’s Time to Face the Doomsday. This very much looking their part crew, tightest leather pants, bullet belts, spiked hair and firmly extended middle finger in your face, likes to play their Motorhead worship at speeds slightly faster than your average punk, thus creating a bastardized hybrid with the speed and thrash metal of the 80s. The opening title track has a pretty cool, even if simple, bass tone. Vocalist DeathLord Astwulf squawks, gurgles and chokes on his words, being constantly pumped up by repeating riffs and pulsating low end. This song is a pretty standard fare in the world of punk/metal crossover, but if this dirty rock’n’roll gets Children of Technology some biker chicks who is to argue. The cover of Swedish Black Uniforms (the band I have never even heard of) called Computer World is more of everything compared to the title track. More riff, more speed, more hooks and definitely catchier overall lines. As someone who needs his punk to be catchy, I applaud the choice of the song and hope that Children of Technology have done it justice. Not bad for a punked up thrash, but overall not real definitive either.